Hello to all! I was incredibly impressed with the reviews on duckhuntitis, perhaps a blog on buckhuntitis is in store? Let me know if you would like to see it!? In a small nod to my one year anniversary of having lived here in Illinois (Yankee state) I thought I'd tip my hat to Capricorns, being that I am one myself, and write a funny but wildly true post about Capricorns including our personality traits, habits, whats important to us and what you should know about trying to date one!? All in good fun! Capricorns are very traditional people, old school, I think, is a better description. They keep closely to family, culture and societal traditions. (For instance, my family down south is very religious as expected, having moved from the bible belt to the corn belt was a real shock. While I don't attend worship every Sunday like I ought too, I still pray and read the bible every day, its just the Capricorn way. Also, my culture is southern, very southern, and its tradition to have opening day hunting season rituals, “thou shall not skip thy rituals”; rubbing last year's duck feathers will bring good luck in this year's duck blind.) As far as societal traditions, this is where the old school part comes into play, while for the most part they adapt with society and learn how to use technology and live with their partners before marriage, they will always revert back to traditional ways when they are seeking peace and quiet. Capricorns can live without their phones or TV and are keen on courtship and traditional marriage. It all goes hand in hand of being a Capricorn. Capricorns are very ambitious, when looking for a partner, money does not speak to them; however, one's personal drive does. They seek real accomplishment, having a $10,000 baseball card collection is not an accomplishment in the eyes of a Capricorn. Career success is super important to them and they seek similar success in their partners. Avoid bringing a Capricorn into the center of attention around new people, they are very shy creatures by nature and will not disarm and open up until they feel comfortable around someone. Capricorns usually seek the company of humble, down-to-earth people, rather than snoody stuck-up people. Although Capricorns have been known to display an arrogant side. Capricorns are very serious, while they can goof off and be silly in their private circle of friends, they are otherwise serious with tendencies to be quiet. Sometimes their quiet bouts are very alarming to their family and friends because they can go from being ridiculously silly to dead serious, usually people think they are sick or angry when this happens. This usually gives people the “hot and cold” sensation from them. Rest assured it is not meant towards you or anyone else, its just how they are. Capricorns value intelligence in an individual, they despise people that play dumb. They enjoy intelligent conversation and a good, friendly debate on important topics in the world. Capricorns also have the highest standards in the Zodiac, for themselves and for others, they are easily disappointed when they fall short of their standards and they are severely disappointed when others don't live up to their own standards, in other words they despise hypocrisy. While Capricorns are loving creatures by nature and do not tend to harbor resentment, they can and do hold grudges, ones that likely last a life time. It takes a lot to truly anger a Capricorn to the point of holding a grudge, but once one has fell onto one's bad side, it is not likely that person will receive forgiveness within their lifetime. Capricorns are capable of truly loving their life partner. For those that are the significant other of a Capricorn you should know that they will protect you fiercely and courageously and will always remain 100 percent loyal and committed to you. A secret about Capricorns, is they aren't as confident as they seem, not that they intentionally put off an air, but their bravery of speaking their mind makes them seem overly confident. Capricorns enjoy a partnership with someone who can always reassure and support them, keep their secrets and face the world by their side. Capricorns are not very materialistic, but hold dear to them the things they do possess, leading them to be a bit stingy, but otherwise they give their resources freely. 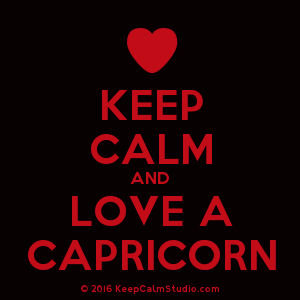 When a Capricorn is attracted you, you will know, because you will receive advice and repeated offers of support from them – a true sign of affection from a Capricorn. Capricorns will also tell you about all of their very unique talents, as a way of impressing you, while they Peacock about what they can do, they never lie about their talents, because when there isn't anyone around to impress, they take them seriously, religiously if you will. Capricorns are big kissers but often times, someone they are incredibly fond of will receive a head nestle. They prefer to show their affection physically in a way that can't be so intimately shared with everyone else. If a Capricorn pushes their face into your neck, chances are, they are incredibly fond of you and adore you like no other. And too, Capricorns are very genuine, generous and sincere, so if they tell you “I love you” you should know that these words hold much importance to them. Also, Capricorns can be selfish towards their mates, or to better put it selfish with their mates, Capricorns have a lot of love to give but do not wish to give it to many people, hence why their inner circle that receives such love is very, very small. While they don't mind sharing their mates with other people, they never like to feel neglected. A Capricorn's partner should always be sure to return the affection they receive from them to make sure they do not feel neglected. Capricorns keep their promises. When they make a promise, they will go to the ends of the Earth to fulfill it. If a Capricorn disavows a promise, then there is always a seriously good reason why. But remember also, Capricorns despise others that cannot keep their promises towards them. A Capricorn's biggest weakness is over-thinking, they succumb to it often, which can tire them out mentally and emotionally. This is why Capricorns always seek a partner that is simple and straightforward as it helps to balance out such a tense habit. Capricorns are the biggest bluffers in the Zodiac, they can hold a straight face for hours, which is usually used as a tactic of intimidation. Often times though their silence or bluffing is used as a weapon when they are hurt. Capricorns at their best are very relaxed and always open to listen to people when they are needed. They take things as they come but plan smart for the future. Capricorns in all their endeavors of being loyal creatures, strive to foster optimism in their lives. So there you have it a small round up of what you should know about that crazy Capricorn in your life! Let me know what you would like to read next! Keep it real and keep it Straight Southern!